Six years ago, Rob Zombie and Marilyn Manson teamed up for their "Twins of Evil Tour." Despite the above poster's claim that "they said it couldn't happen again," the Twins of Evil are in fact back for another batch of dates. 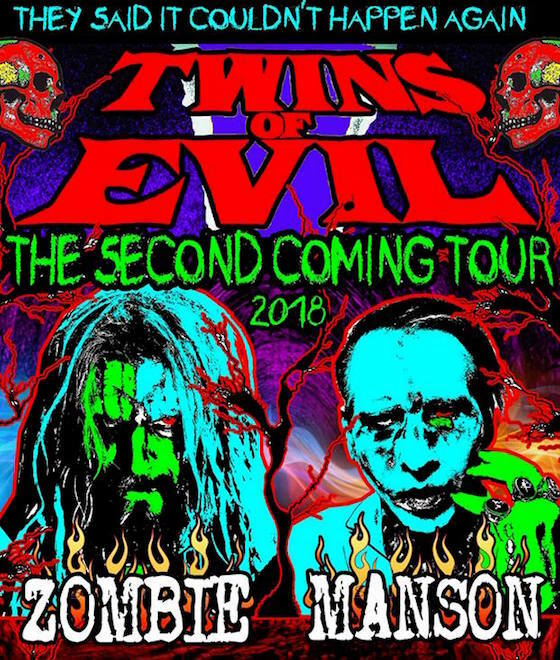 Mr. Manson and Mr. Zombie will team up for a run of shows throughout the United States. They'll also pop into Canada for a single show, performing at Toronto's Budweiser Stage on July 26. While we can understand Manson's hesitance to return to Alberta, it's still a shame that there aren't more Canadian dates. Either way, you can check out the full itinerary below. Tickets will go on pre-sale on March 19. Pre-order an autographed 15-LP Rob Zombie box set via MusicVaultz.